Homemade Blueberry Muffins with Sour Cream - These are THE BEST! Homemade blueberry muffins with sour cream and fresh or frozen blueberries are a delicious treat for breakfast or snack-time. The unique baking technique helps render perfect, moist blueberry muffins every time! There’s just something about homemade blueberry muffins that says, “I love you.” They are comforting. Delicious. Homey. Blueberry muffins are not fancy. They’re not decadent, like chocolate chip muffins. They’re just regular old muffins. But boy, they sure are good! And these may even be the BEST blueberry muffins! 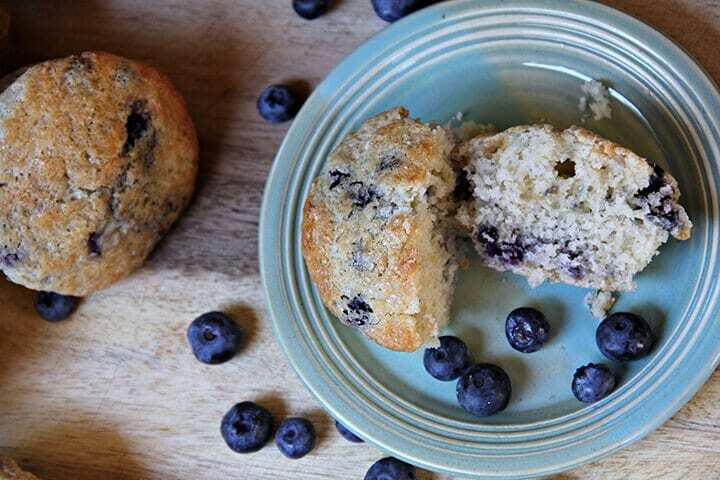 I like to use sour cream when making muffins or quick bread because it’s a great way to ensure these easy blueberry muffins stay moist and it adds a nice subtle flavor. Blueberry muffins with sour cream or banana bread with sour cream will stay fresh longer too—which usually is not a concern around here! A good whisk – you can use this for so many recipes! Muffin pans – Fat Daddio’s baking pans are my absolute favorite for value and quality! Breakfast Casserole – the best breakfast casserole! 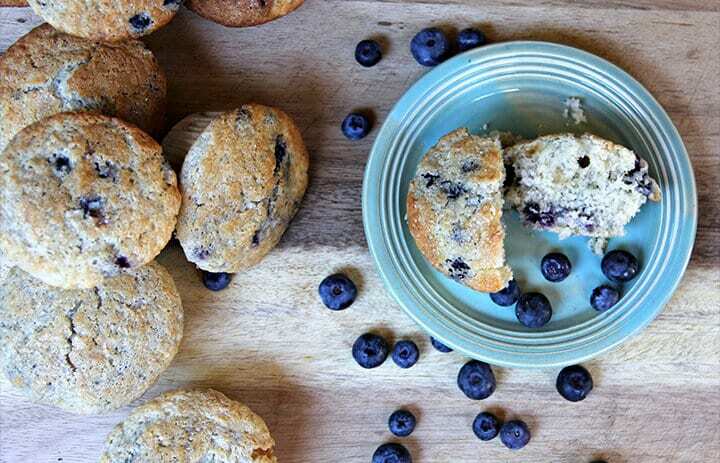 These homemade blueberry muffins are made like any muffin or quick bread. You whisk together the dry ingredients, then the wet ingredients, then fold the wet into the dry. Step 1. Preheat oven to 425º and place large baking sheet in oven on rack in lower third of oven. Grease muffin pans or place paper liners in muffin cups. Step 2. In large bowl, whisk together flour, baking powder, salt, and sugars. Step 3. In a small bowl, stir a little flour gently into the blueberries to coat. Pro tip: Use less flour if your berries are frozen as more flour will tend to get gummy. Step 4. In another bowl, whisk together the eggs, egg yolk, melted butter, oil, milk, sour cream, and vanilla. Step 5. Add the egg mixture to the flour and fold gently just until all flour is incorporated. Gently fold in the blueberries. Step 6. Place batter in muffin cups almost to the top. Pro tip: I use an ice cream scoop to drop the batter into the muffin cups. One scoop is usually just the right amount. Step 7. Sprinkle turbinado sugar over muffins. Place muffin pans in oven on top of the heated baking sheet. Step 8. Turn oven temperature down to 400. Step 9. Bake 18-20 minutes until muffins are golden brown. Pro tip: While these blueberry muffins are best eaten the day you bake them, they are so moist and tender that you can store them for a few days in an airtight container and they will still be delicious. These homemade blueberry muffins are just the right balance of sweet and tart, with lots and lots of blueberries. You can use fresh or frozen blueberries. I have actually used both because I didn’t have quite enough fresh. You can either use paper muffin liners or spray the muffin pan with baking spray for these blueberry muffins. I prefer to bake them in the pan without the liners unless I’m taking them to someone as a gift. Frozen blueberries will bleed a little, making the whole muffin slightly purply but neither the taste or the texture will be affected. Pro tip: The hot baking sheet on the bottom rack helps the muffin pan get hot quicker which causes the muffins have a nice rise on top.You have to remember to turn the temperature down once you put the muffins in the oven though! You can make the batter the night before and bake these blueberry muffins in the morning if you need to save time. 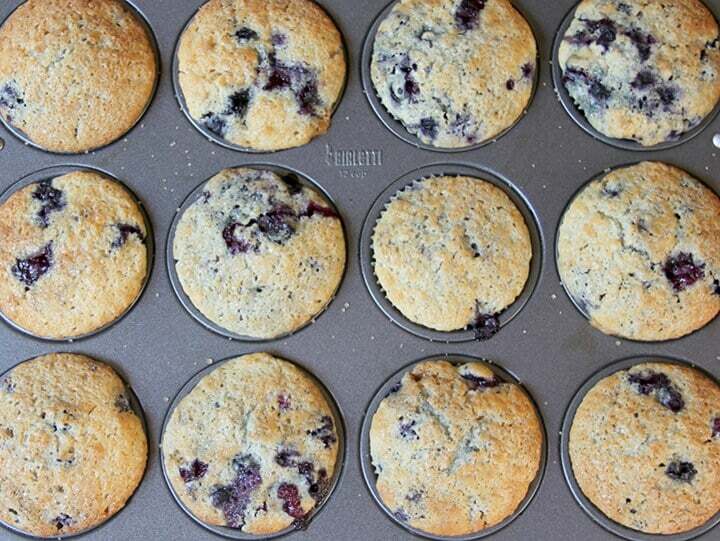 To freeze the blueberry muffins, place the baked muffins on a baking sheet in the freezer for a few hours. Once frozen, you can put the muffins in a freezer bag and save for up to 3 months. 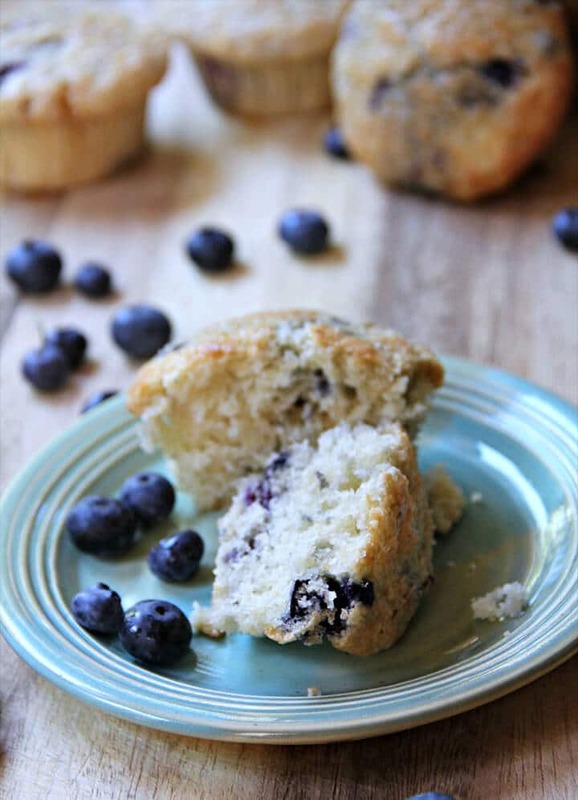 I love to add these blueberry muffins to my brunch menu and serve them alongside my favorite Easy Quiche. Add some cheese grits and a bowl of fruit and you have a perfect meal! If you’ve tried this recipe, please rate the recipe and leave me a comment below! Homemade blueberry muffins with a moist and tender crumb and lots of blueberries. These muffins are great for breakfast, afternoon snack, or anything in between. Note: If using frozen berries don’t get them out of the freezer until the very last minute. The more they have time to thaw the more they will run. Preheat oven to 425 and place large baking sheet in oven on rack in lower third of oven. Grease muffin pans or place paper liners in muffin cups. NOTE: You will turn the temperature down when you put the muffins in the oven. In large bowl, whisk together flour, baking powder, salt, and sugars. In a small bowl, stir about 2 tablespoons flour gently into the blueberries to coat. Use 1 tablespoon if berries are frozen as more will get gummy. In another bowl, whisk together the eggs, egg yolk, melted butter, oil, milk, sour cream, and vanilla. Add the egg mixture to the flour and fold gently just until all flour is incorporated. Gently fold in the blueberries. Sprinkle turbinado sugar over muffins. Place muffin pans in oven on top of the heated baking sheet. Turn oven temperature down to 400. Bake 18-20 minutes until muffins are golden brown. Use less flour if your berries are frozen as more flour will tend to get gummy. Use an ice cream scoop to drop the batter into the muffin cups. One scoop is usually just the right amount. You can store the blueberry muffins for a few days in an airtight container. The hot baking sheet on the bottom rack helps the muffin pan get hot quicker which causes the muffins have a nice rise on top.You have to remember to turn the temperature down once you put the muffins in the oven though! Update Notes: This post was originally published August 29, 2014, and on January 11, 2019, was updated with one or more of the following: step-by-step photos, video, updated recipe, new tips.